An interview with the late Georges Fontenis conducted by José Antonio Gutiérrez D. on 19 February 2005. The international anarchist-communist movement recently suffered a loss with the death of Georges Fontenis, one of its historical leaders, a man with a clear vision who continued to be active up to the very end. Without a doubt, Fontenis was a point of reference for the new generation of anarchist-communists in Latin America, a region that caught his attention but that he was never to see in person. His "Manifesto of Libertarian Communism", the result of debates and a process of maturation within the post-War French anarchist movement, has enjoyed wide circulation and has become a starting point for various libertarian organizational processes, dare I say a turning point that has given a new revolutionary slant on provide a revolutionarto the libertarian tendencies that have sprung up like mushrooms after the rain in the neoliberal debauchery of Latin America since the '90s. Unfortunately, most of his work has still not been translated into Castilian, and only a little in English. 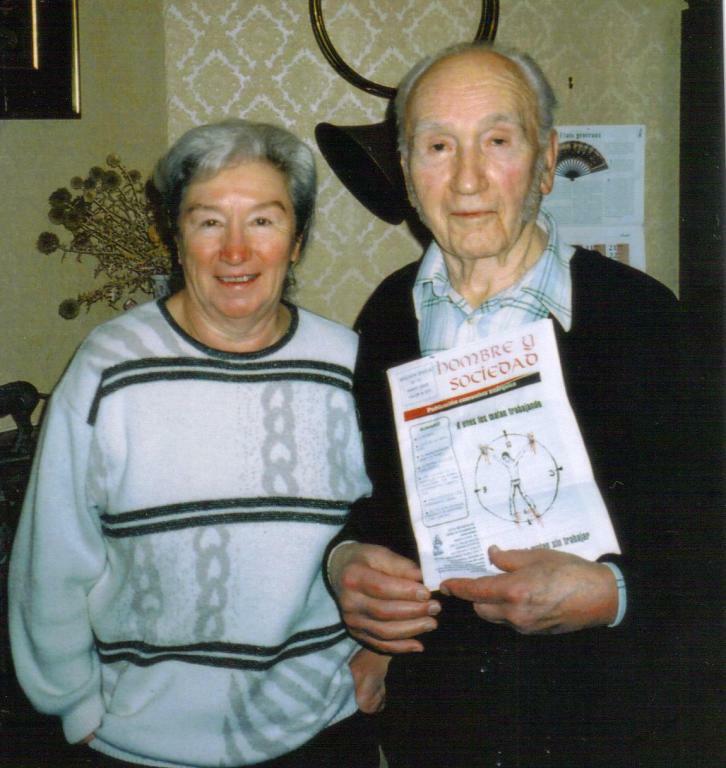 The following interview was conducted on 19 February 2005, with the help of comrade Lorenzo Mejías (who helped out with questions and interpretation), at the home of Georges Fontenis in a small town near Tours called Reignac-sur-Indre. We spent the day with him there, enjoying the wonderful hospitality he and his companion Marie-Louise provided; Fontenis regaled us with his fascinating reflections that filled us with questions about the Latin American situation and made us laugh with his fine sense of humour. I will always remember the generosity and good nature of this legend of anarchist communism. Not every day can you meet a person whose range of topics of conversation go from national liberation and the question of support to the combatants in Algeria, to the passivity of many French people during the Nazi occupation (at one point during our talk, he said, "Many of those who were to call us 'traitors' for supporting the cause of Algeria, were people who had remained silent and had collaborated with the Nazis in France, and were never bothered by it... but of course after the Liberation, everyone was a hero of the Resistance"), from the intestine clashes within post-War French anarchism, to his love for horses, magnificent animals "brutalized by two-legged beasts". He really was a lovely comrade and a very special person. This interview was part of a much longer conversation lasting a whole day, which it was not possible to record completely. We just recorded some specific questions during this lively meeting, which concern the militant career of Fontenis, the post-War libertarian movement and the debate on the "Platform"*, and the relevance of the libertarian movement today. Despite physical effect of the interview on the comrade's physique (his Parkinson's was in a fairly advanced stage and he had to rest for while half-way through the meeting), the lucidity of his thought is clear from reading this interview and reading of some of his later writings, such as Non-conforme**, which are characterized by a refusal to accept easy truths and a search for new answers to current problems. Our conversation has remained unpublished up to now ***, but was originally intended to be incorporated in a new Spanish edition of the "Manifesto". However, with the sad news of Fontenis' death, we have decided to publish it as a posthumous tribute from this site. I'd like to conclude simply by quoting a dear comrade from Peru, Franz Garcia, who described the life's militancy of Fontenis thus: "We believe, therefore, that it is necessary to re-read this libertarian communist and give him his rightful place in today's context, so that we can use his contributions to our movement to keep moving forward and give anarchism back its real and true dimension among the people's movements, far from the prejudices and subjective biases that are so frequent and harmful to our ranks". * The "Platform" we refer to is the anarchist tradition that derives from the "Organizational Platform of the General Union of Anarchists", a project drawn up by a group of Russian and Ukrainian exiles in Paris in 1926, amongst whom were Petr Arshinov and the insurgent leader, Nestor Makhno. The ideas contained in it, based on the need to mark out a revolutionary, class-struggle tendency within the libertarian movement and create an organization based on clear principles (theoretical and tactical unity, collective action and discipline, federalism), inspired the French Union Anarchiste from 1928 until the '30s and, later, the Fédération Communiste Libertaire, founded in 1953 with Fontenis as general secretary. ** Georges Fontenis, Non-conforme, Nice 2002. ** A comrade of ours recently circulated an uncorrected version of this interview in internet, saying that it had been published in "En La Calle", the magazine of the ex-OSL in Argentina. This is incorrect. While it was at one time the intention to publish the interview there, this did not happen for reasons of space. How did you get involved, both as a militant and within anarchist circles? My father was a revolutionary socialist, in Marceau Pivert's tendency within the Socialist Party (Parti Socialiste - PS) in the 1930s. My grandfather had also been a socialist militant, taking part in the founding of the unified socialist party in 1905  in the days of Jaurès and Sembat, and I was completely surrounded by an atmosphere that encouraged consideration of social questions. I was shocked, of my own accord, by social injustice. Apparently, when I was a little boy I used to occasionally try to wake my classmates up to these problems. When I was 14 or 15, we were in the northeastern suburbs of Paris, in Noisy-le-Sec, where there are railways and factories, and I used to look at what was being sold on newsstands. First there were the newspapers that my father took, like "La Bataille Socialiste", the newspaper of his tendency, and I also saw some extraordinary papers in the kiosks such as "Le Libertaire" or "La Vérité", and began to read them. I immediately leaned towards "Le Libertaire", as its line seemed to deal with the questions I was asking myself. But in 1936 I did not agree with its position on the war in Spain. I found that the militants of "Le Libertaire" were not responding to the questions that anyone could ask: What were libertarians doing in a government that actually belonged to the parliamentary right? This led me to meet a couple of libertarian workers from Noisy, I don't remember exactly in what circumstances, and together we organized a public meeting on the war in Spain. There was a reasonable attendance, but the delegates from the Union Anarchiste, from "Le Libertaire", were unable to answer people's questions. This struck me very much, for there was plenty to say. I kept seeing schoolmates, one of whom was an Italian-born anarchist militant, whose parents had fled the Mussolini regime and with whom I once again met up recently, two years before his death. In this way I became interested in libertarian ideas, but always with a critical eye from the beginning. Things went on like that until the Second World War. Those years flew by. When Paris was liberated, when I was already working as a teacher in 1944, there was a series of posters on walls around the city inviting people to contact the anarchist branch at the Quai de Valmy, 145. As I got there, I was told that I could render great service, as the Libertarian Youth had to be reorganized. And so it all started. What did your activism consist of under fascism and the occupation? During the Nazi occupation I was a clandestine union activist. Together with other colleagues, we had organized a union branch in the 19th arrondissement in Paris, we paid dues to the clandestine CGT, even though none of us could ever be sure of where the money was going. This meant that after the Liberation, the union appointed me to represent it, or rather, to represent the youth of the teachers' union at the ministry. Actually, there was no benefit in this personally, but it did enable me to meet former officials who had important positions in the Socialist Party or the Communist Party, and it also allowed me to realize the extent to which education leaders had collaborated with the fascists. The older militants were silent. Those who were disgusted by it or who intended to resist did not hesitate to express their opposition and to denounce the traitors. But many militants did not want to talk about it. Don't forget that France at that time was not "resisting" much. Many union bureaucrats were satisfied with a sort of reformed Vichyism . But among teachers in general, attitudes were more varied. There were actually sectors that resisted, such as the one where I was. Our resistance was not very spectacular, we weren't the ones who killed German officers in the metro, but it was hard during the final days of the occupation. But ultimately, they knew we were against them and that a majority of professors and teachers were on our side. For example, I had a colleague whose wife was from Alsace and had been suspected of helping the Resistance. She was arrested, interrogated and shot. And this did not shock people. The people of Paris let the Germans be. All this talk of the heroism of the Parisians under the occupation is not true. It must not be confused with the enthusiasm about the Liberation, when everyone wanted to claim their share of glory. How did the move towards the FCL come about? To what extent was it determined by external factors, by the social context, and to what extent was it determined by internal elements within the movement, by militant criticism for example? When the libertarian movement got together again at the congress of Paris in October 1945, we chose the name Fédération Anarchiste [FA - Anarchist Federation], but it was really a federation that tried to unite people who were too different, it was the "Synthesis". There were those that we called the "charlatans," there were the anti-religious who engaged only in anti-religion activities, there were some syndicalists, there were the literati, semi-philosophers such as Charles-Auguste Bontemps... basically there were two currents. On the one hand, what we might call the "intellectuals" and, on the other, the young people and the workers. It was among the latter two groups that you could see the sort of mentality that corresponded roughly to the "Platform", with the memory, among the older ones, of the struggles around the "Platform" in the 1920s. Don't forget that the Union Anarchiste (UA) before the War was heavily influenced by the "Platform", above all between 1927 and 1930, and Secretary of the UA at the time, Louis Estève, would be among the leaders of the FCL in the 1950s. I am still friends with his son, a union activist in the same current as myself. So, there were these two tendencies whose coexistence turned out to be impossible. The people from Bordeaux, for example, had no interest in anything except anti-clericalism, and when there was anything else to be talked about, they just disappeared. They made speaking tours which had no specifically anarchist content, only anti-religious and free thought. I'm not saying this was wrong or useless, it just wasn't enough. I remember some socialist militants in my neighborhood who told me "you're stuck in murky waters with your preachers!" - and I couldn't answer that. They were largely right. From the beginning it was a false union between two very different currents. On the one hand were people like Aristide Lapeyre and his friends who were content with an apology for wild anarchism, and, on the other hand, all the youth brimming with outrage and demands. There were meetings where we faced up to each other. I always remember one meeting that took place at 10 Rue de Lancry in Paris, in which Aristide Lapeyre spoke long and loud about the freedom of Man, with three capital Ms, and in which Nédélec, a worker from the Renault factory in the revolutionary tradition, began to attack him with no qualms. "Things are not like that in Renault. There we have to fight, to struggle", he said. To which Lapeyre said, "But comrade, we can all see that you are young and mad with impatience, but we are the ones who are right, you're just out for adventure", and so on. Poor Nédélec had no answer to that and left. And I wanted to leave, too. It was like an open sore. We were in the same organization but in reality there were two organizations - the Platformists and the humanists, simplifying a bit. After a while, the opposition between the two sides just got worse. When it came to difficult moments, such as the colonial war in Indochina  or the struggle against the creation of a European Defence Community, you realized that it couldn't go on like that for long. Finally, we reached a situation where the humanists admitted the possibility of creating internal tendencies. And they created their own, though they never spoke about it. They always talked about the Platformist tendency, the Organisation - Pensée - Bataille [OPB - Organization, Thought, Battle, though a better translation, one closer to the thinking of Berneri, originator of the phrase, might be Organization, Theory, Action], but never talked about their group, organized in the Commission d'études anarchistes [CEA - Anarchist Studies Commission]. In fact there were two tendencies, two kinds of writings, two modes of activity, two types of activism. This went on from one congress to the next with increasingly violent confrontations. We ended up telling each other a few home truths, in no uncertain terms, and the FA entered a phase of survival. That was until the Bordeaux congress in May 1952, when some people left. The first to leave were those we called the "charlatans." Later, at the Paris congress in May 1953, came the rupture, because our Platformist friends from the Paris-Nord group, from Aulnay-sous-Bois, and so on, presented revolutionary texts that the Synthesists could not accept. Then we asked them: "Do you accept or not? Are we the majority or not? ", and they left. Because it was not actually a split. It was called a split for the sake of convenience, but what happened was that the purists and the Synthesists went off and left us alone. For our part, we had the most active groups - in the Renault and Thomson factories for example - or those in the working-class neighborhoods and suburbs of Paris, in Aulnay-sous-Bois, Bondy, Paris-Nord, Paris-Est. Some of the members of these latter two groups were certainly Platformists, even if the term was not used much at that time. And we had also active comrades in the provinces, where some had heard of the Platform and made contact with us. As for the purists, have formed their own Anarchist Federation in 1953 but had nothing in common between them. Someone like Maurice Joyeux has nothing to do with someone like Aristide Lapeyre, for example. When I talked personally to Lapeyre, he would say that Joyeux was a moron, and Joyeux in turn called Lapeyre a "charlatan", to use the expression used then. But getting back to your original question, the FA had two main tendencies from its beginnings in 1945, despite the appearance of unity. What was the social make-up of the FCL? Was it different to the original FA in 1945? How did this evolve later in the MCL or the first OCL? Among the purists of the FA there were mostly small traders, market vendors, small business people. For example, the treasurer of the FA, Georges Vincey, owned a clothes shop in the Rue Vieille du Temple in Paris. Lapeyre was a barber. Arru had a small printing press. For them, the proletariat meant nothing, all that was important was "man", "Man" with a capital M, Man who must be free, and so on. On the other hand, the people who made up the FCL a little later were workers, young people and students. In fact many of our members met in the Youth Hostels , where there were many libertarians and many Trotskyists. When the Hostels were nationalized, libertarians were divided, some of them accepted it while others formed an independent hostel movement. When we formed the MCL, and later the OCL, there was the same sort of social make-up - students and workers. What is your analysis of the fact that both the FCL and the MCL were the result of historical traumas, i.e. the Libertarion of 1944 and the strikes in May '68? Can we make a historical parallel between the two experiences? To what extent were they the result of the political and social turmoil of those times? To some extent, yes, they were the products of their time. Certainly, when there is a major political issue, people will think more, and more easily, about the issue. The problem is that people who got together to stick up posters couldn't then come together to create a committee, be active, meet the workers. But if there had been no May '68, there would have been no MCL in 1969, and the OCL developed because of all the workers' struggles in the first half of the 1970s. Both these groups were linked to their contexts. If nothing had happened at the social level, perhaps there would have been no split in the FA in 1953, or at least not such a quick one. But there's no point in this sort of speculation. Superficial anarchism is often content with rejecting demands relating to identity and the right for peoples to be autonomous. In Latin America this causes problems between anarchists and indigenous organizations, for example. On the other hand, the Federación Anarquista Uruguaya was strongly influenced by Franz Fanon's theories about the struggles of oppressed peoples. How can you reconcile internationalism, anarchism's historical position, with the right of peoples, especially today with all the demands relating to identity and national identity? How did the FCL articulate the two positions during the Algerian war? Here too there are two types of position. The traditionalists reject colonial militarism and the struggle for independence alike. It is a position which seems to be pure, very beautiful. But revolutionaries also need to think about how to weaken their enemies, and consequently they must choose sides. In the FCL, we chose as our side the support for the struggles for independence, with no illusions. It was what we called a position of "critical support", meaning that we supported the MNA and the FLN  while saying "Careful, don't forget that there is a problem, that they will create a bourgeoisie and militarism". The purist position is to allow events to happen, a position of non-intervention that leads nowhere. While with our position of "critical support", without applauding everything the Algerians did, we helped them and told them "Take care, there is a revolutionary problem, a problem of class struggle that cannot be avoided". And we were right in this regard! When I talked to nationalist leaders like Messali Hadj , they did not say otherwise, but neither did they dare openly proclaim it to their troops. I also met Mohamed Boudiaf  towards the end of the war, and realized that Algeria was headed down the reformist path because it had not raised the issue of social classes, a position he set out in a book entitled "Où va l'Algérie ?" (Where is Algeria going?). You might think that we influenced such reflections. At first Boudiaf was a pure nationalist. However, we later find someone like Mohamed Harbi , who had critical positions on the Algerian independence struggle. After a lifetime as a militant, what do you think has been achieved or can be learnt from the experiences of the FCL, the MCL and the first OCL? It's not easy to answer this. I believe that there's nothing to regret. Progress has been made and experience has been acquired. To do the same thing today would be ridiculous. But I think one of the lessons we have learned is simply learning to learn from our experiences, for example, between the FCL and the MCL and between the MCL and the OCL. At each stage, there was some small progress, new ways of seeing things. But in my opinion this way forward is hard to beat. I don't think we should necesarily trust blindly in the things we've done, but we must pay attention to positive developments, to our way of analyzing and dealing with problems. For example, in the OCL's newspaper, "Guerre de classes", we never spoke about a foreign country without analyzing the social situation in terms of class. In any event, I think it's important to adopt a position of "critical support", for example to support national liberation struggles while making a critique of what they are and tracing the possibilities to correct them. That was Bakunin's position on the Paris Commune: it was not a question of the French army but the French people, who should rebel against the French Empire while at the same time fighting against the German Empire. I don't think Bakunin is given the attention he deserves. This is what we tried to do, more or less successfully, and the same questions will be asked again in the future. As a militant, what are your views of the anarchist communist movement today? I may be over-optimistic, but I see that in many places there are groups that are forming, even if they are small. Argentina, Chile, Uruguay... But you cannot create an international union of sections that do not actually exist. First you have to create the sections, militant organizations that can then go on to unite. You have to start at the base. I don't think you can build an international movement artificially. What they are doing in Chile and Argentina is very good. You can't do otherwise. We need to create small anarchist-communist groups and then see if we can go further and create international unions, regional ones, continental unions, and so on. In your opinion, what are the main tasks of an anarchist-communist militant, both in general and in France? I think we should invite the militants to reflect, to see what it is we are trying to do and see what we can do next, in the area where each of us is. It's the same problem everywhere, perhaps with differences. In France or Italy, for example, the libertarian movement already has a long tradition, while in countries like Germany or England, there has always been great dispersion. As far as France is concerned, we must continue to be present in the unions, in the mass struggles for housing, for rights. Continue doing what we already do, but doing it well, and doing more if we can. I think that despite everything, we are going in the right direction, which doesn't mean we can stand back and admire the groups that exist. The time will come when other people will have to join, militants from different backgrounds. In the context of the global dictatorship that is being imposed, with the development of the European Union, cuts in public services, increasing job insecurity... might these fundamental changes significantly affect the conclusions reached in the FCL or the first OCL? I don't think so. The conclusions are the same and, indeed, even more intense. Today, when people go on strike or take to the streets in protest, it is to defend vital things. The governments of the day destroy all our social rights, increasingly so. Today's struggles concern more basic things, more important things than a few years ago. Do you think there have been fundamental theoretical contributions that have allowed us to advance in a revolutionary way in recent years? Or has theoretical production not been up to the current historical moment? I think we are still in a phase of preparation. But there are good signs. I get a large number of local and regional publications, small pamphlets and newspapers where I see the same questions arise and about which there is some reflection, an attempt to understand things. This was not happening ten years ago. There is for example a small magazine produced in a suburb of Paris, "Cinquième Zone", which encourages young people to reflect and take a stand. There is another in the Basses-Alpes region which is interested in international issues, conducting research, for example in-depth research on Jordan. It is much more interesting than reading a newspaper like "Le Monde" or reading certain "professional" magazines. Obviously all this cannot mature in an instant, but there is something that is opening. Do you have any final words for the comrades reading this interview? I hope I've been clear. And above all, wherever you are, you need to think and encourage others to think, to look for ways to struggle and denounce the State and exploitation in ways that are sensitive to the local situation. Retrieved from Anarkismo.net on 14 March, 2012. 1. This tendency left the PS in 1938 to form the Workers and Peasants' Socialist Party (Parti Socialiste Ouvrier et Paysan - PSOP), which provided active assistance to the Spanish anti-fascists, unlike the Socialist Party's generally. 2. The French Section of the Workers' International (Section Française de l'Internationale Ouvrière - SFIO) was born from the merger of Guesde's Socialist Party of France and Jaurès' French Socialist Party. After the Russian Revolution in 1917, it split, with the majority going on to become the French Communist Party. 3. The "Labour Charter" was a piece of corporatist legislation which was in effect in France under the fascist regime between 1941 and 1944. 4. After the defeat in 1940, Northern France was directly administrated by the German army while the rest of the country was under the control of a semi-independent, fascist, French State led by Marshal Pétain. "Vichyism" was the name given to his fascist regime which was based in the town of Vichy. 5. Between 1946 and 1954, France tried to cling on to its Indochinese colonies against Hồ Chí Minh's Việt Minh guerrillas. 6. The FA only took the name Fédération Communiste Libertaire (FCL - Libertarian Communist Federation) in November 1953, following a referendum among the members. 7. The Youth Hostel movement allowed young people of modest backgrounds to holiday cheaply. It was made up of a network of hostels run by militant workers and was almost wholly nationalized after 1945. 8. The Mouvement National Algérien (Algerian National Movement) and the Front de Libération Nationale (National Liberation Front) were the two rival movements who both struggles for Algerian independence between 1954 and 1962. 9. Ahmed Ben Messali Hadj was the historical leader of Algrian nationalism, but lost out to the young supporters of armed struggle who created the FLN. Hadj thus formed the Mouvement National Algérien (MNA), whose fratricidal struggle with the FLN ended up in victory for the latter. 10. Boudiaf was one of the founders of the FLN. Forced into exile in the early '60s, he returned in 1992 as president of the military-backed High Council of State, but was assassinated several months later. 11. Boudiaf was removed from the leadership of the struggle before the end of the war. Harbi was a leading member of the FLN but was jailed after independence, between 1966 and 1971, for "Marxist deviations". He is now a historian, living in France.